Weber, Nancy H. (nee Hitchon) (February 2, 2018). Beloved wife of the late John F. Weber. Loving mother to Susan (the late James) McHale, John F. Weber Jr., Nance (Gerhard) Schredl, and Joan (David) Hodkinson. She will be missed by her 5 grandchildren Lauren, Michael, Katherine, Christopher, John (Jack), Step grandchildren Bruce Hagley, Brad and Kevin Schredl and their spouses, Step Great granddaughter Ava and Great granddaughter Maxie. 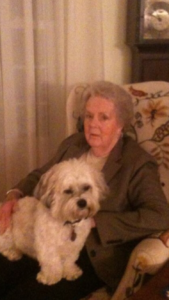 She will be greatly missed by her long time companion Fred. Relatives and friends are invited to Nancy’s Viewing Thursday 2/8, 6-8pm, and Friday 2/9 10-11am Craft Funeral Home of Erdenheim 814 Bethlehem Pike. Nancy’s Funeral Service to follow Friday 2/9 11am Craft Funeral Home. In lieu of flowers contributions in Nancy’s name may be made to the Wounded Warrior Project PO BOX 758516, Topeka, KS 66675, or Pennsylvania SPCA 350 E Erie Ave, Philadelphia, PA 19134. I am so sorry for your loss. My thoughts and prayers are with your family .